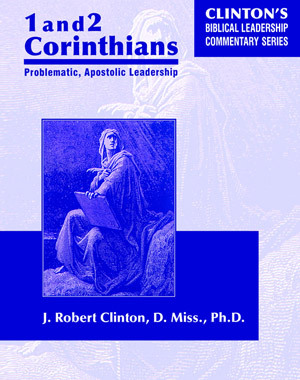 This 411 page book (pdf file) is one of a series of Biblical leadership commentaries. This series explores the most relevant books of the Bible for leadership findings. The leadership commentary on 1,2 Corinthians involves an overview of the books of 1,2 Corinthians, i.e. a recognition of the contribution of these two books as a whole to the Bible. It includes identification of 7 important leadership topics/lessons in 1 Corinthians and 9 important leadership topics/lessons in 2 Corinthians. Then there is the actual leadership comments on the text. Most importantly, these books deal with 10 crucial problems in 1 Corinthians and 1 major problem in 2 Corinthians—all of which reoccur in our present leadership era. It shows how an apostolic leader, Paul, deals with a problematic church. Much can be learned about the Pauline approach to problem solving. Finally there are 74 leadership articles totaling 271 pages describing various aspects of leadership seen in 1,2 Corithians. The messages of 1,2 Corinthains contain the advice of an Apostolic worker (in his mid 50s in age), who must solve these problems or perhaps face the end of his ministry. The Corinthian books rank closely behind 1,2 Timothy and Titus as two very important books dealing with leadership for the church age.